There upon the highest and the darkest of all the pyramids did we stand. In the depth of that aged city - we the fortuitous spawn of the great Father Pan. The good Doctor, the demon and I. There, there within the darkness of She who would one day bare us. There, there, there beneath the weight of Him whom some call Priapus. Open your mind and let it all in." So spoke the mentor that old mentor of mine. I, such a fool, would then suddenly chime. As my sense of self sputtered then faded away. Ah - for the days of the good Doctor, the demon and I. Like minnows in the shallows - they eddy and they glimmer; they rise and they dive. The Doctor dead; the demon gone and me? Adrift upon a wretched and black ocean or sea. Send off to him or the demon or even to hide from the very likes of you-know-who. In your harried houses and your hallowed halls! Addicted to religion and credit and the ever-ringing telephone. Go back, go back, go back into your stalls. Like cattle to the slaughter - like shop-aholics to the malls. Thrice now - has come the mighty Beast, the high Christ and Avatar of Us All. The talking snake, the ancient Tree that bore the fruit that brought the "Fall." As we studied Bree-sheet bera Elohim - three times, three times, three times a day. The Law is for all - the law of the strong - the law of the brave - the law that incurs the annoying wrath of the slave. Let the law's number be known - the number ninety and three. Far from the days of the dawning, the golden and glorious sun. I gaze back in wonder at those days so far behind. As I remember and as I reminisce with all of my might. To assist in remembrance - to aid and to cue. Whilst old movies played in silence like some twaddle in a dream. This god-of-a-man, this holy magus and Jew. "To do what thou wilt is not always within one's reach! You may one day break free of the many chains that now bind you." Whilst he joked about Nazis and cameras in heads. With angels and daggers and pretty portraits from hell he would keep. "Back to work," he would grumble about one or a quarter to two. "There is so little time and so, so very much to do. Now where are my cigs? Say - will you lend me a Marlboro again?" And forget not the Muslims - for they have an appetite too. For to reshape and reform you is their highest of goals." "And remember to hate others only so much as you hate yourself." He would jest as a billow of smoke drifted by me, the demon and nobody else. Conversations, incantations, initiations and the making of books for to be placed upon somebody's shelf. Ravaged by space and tainted by time, by the rotting of brains and the shrinking barrels of vodka and wine. So alive, so puissant, so rich and so very grand. 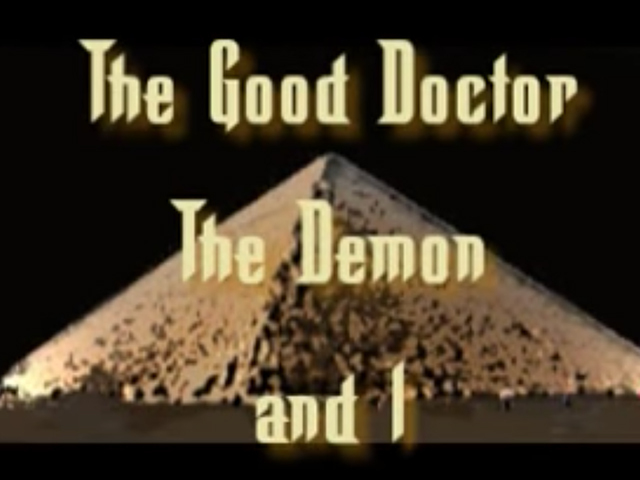 To the days of the good Doctor, the demon and I.